A sketch of "Queen Joan's Retreat" at Baron Hill, near Beaumaris on the Isle of Anglesey. The description on the drawing reads, "This plain sarcophagus, (once dignified as having contained the remains of Joan, daughter of King John, and consort of Llewelyn ap Iorwerth Prince of North Wales, who died in the year 1237) having been conveyed from the friary of Llanfaes, and alas! 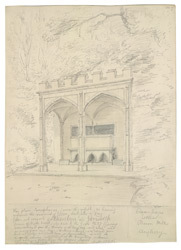 used for many years as a horse-watering-trough, was rescued from such indignity, and placed here for preservation, as well as to excite serious meditations on the transitory nature of all sublimary [sic] distinctions by Thomas James Warren Bulkeley, Viscount Bulkeley."